ROCHESTER, N.Y., April 9, 2019 /PRNewswire/ -- Vuzix® Corporation (NASDAQ: VUZI), ("Vuzix" or, the "Company"), a leading supplier of Smart Glasses and Augmented Reality (AR) technology and products, is pleased to announce a strategic partnership with VSee Lab Inc. ("VSee"), a San Jose-based video telehealth company, to introduce a telehealth and telemedicine smart glasses solution for Vuzix' M300XL and Vuzix Blade Smart Glasses. VSee provides a HIPAA-compliant video telehealth and telemedicine video conferencing solution that is used by more than 1,000 telemedicine companies operating all over the globe, including MDLIVE, Walgreens, McKesson, International SOS and DaVita, as well as numerous A-list healthcare systems such as Ascension, HealthPartners, Sutter, Trinity and Sentara. VSee was also selected by NASA to be the exclusive video conference solution on the International Space Station (ISS) because of its usability and its ability to adapt to poor network conditions. It has been used by astronauts on board the ISS since 2014. "The VSee telemedicine video conferencing platform is easy and simple to use. We are excited to offer a telemedicine video conferencing smart glasses hardware option to our existing customers, first responders and to VSee's extensive telemedicine customer base," said Paul Travers, President and Chief Executive Officer at Vuzix. "While VSee previously worked with some early generation smart glasses solutions, the technology was not ready for telemedicine. We feel very privileged now to be partnering with Vuzix with its mature smart glasses offerings. Telemedicine video conferencing through smart glasses from Vuzix is a natural progression from tablets and computers for our customers. We are excited to begin realizing telehealth smart glasses applications from remote training on imaging technology (CTs, ultrasounds) and inserting IVs to telesurgery to AR-enhanced video visits. We look forward to continued collaboration between our two companies," said Milton Chen, Chief Executive Officer at VSee. 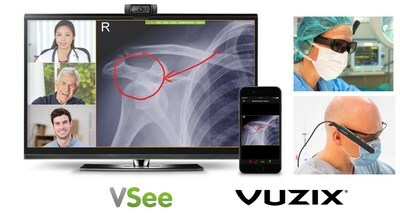 The VSee telehealth and telemedicine solution for the Vuzix M300XL and Vuzix Blade Smart Glasses is expected to be commercially available during the second quarter of 2019. Vuzix is a leading supplier of Smart-Glasses and Augmented Reality (AR) technologies and products for the consumer and enterprise markets. The Company's products include personal display and wearable computing devices that offer users a portable high-quality viewing experience, provide solutions for mobility, wearable displays and augmented reality. Vuzix holds 153 patents and patents pending and numerous IP licenses in the Video Eyewear field. The Company has won Consumer Electronics Show (or CES) awards for innovation for the years 2005 to 2019 and several wireless technology innovation awards among others. Founded in 1997, Vuzix is a public company (NASDAQ: VUZI) with offices in Rochester, NY, Oxford, UK, Barcelona, Spain and Tokyo, Japan. For more information, visit Vuzix website, Twitter and Facebook pages. VSee is the video telehealth company behind NASA Space Station, Trinity, Ascension, DaVita, MDLIVE and 1,200+ customers, and the parent of This American Doc medical group—an airbnb-like marketplace for physician staffing. VSee empowers health organizations and practitioners to achieve better patient care and improved efficiency through simple, scalable telehealth. Its modular platform provides powerful flexibility for fast customization to a wide range of workflows from ER diversion to e-ICU to on-call specialist consults to chronic care management. Learn more at vsee.com. Certain statements contained in this news release are "forward-looking statements" within the meaning of the Securities Litigation Reform Act of 1995 and applicable Canadian securities laws. Forward looking statements contained in this release relate to our business relationship and future opportunities with VSee, and among other things the Company's leadership in the Smart Glasses and AR display industry. They are generally identified by words such as "believes," "may," "expects," "anticipates," "should" and similar expressions. Readers should not place undue reliance on such forward-looking statements, which are based upon the Company's beliefs and assumptions as of the date of this release. The Company's actual results could differ materially due to risk factors and other items described in more detail in the "Risk Factors" section of the Company's Annual Reports and MD&A filed with the United States Securities and Exchange Commission and applicable Canadian securities regulators (copies of which may be obtained at www.sedar.com or www.sec.gov). Subsequent events and developments may cause these forward-looking statements to change. The Company specifically disclaims any obligation or intention to update or revise these forward-looking statements as a result of changed events or circumstances that occur after the date of this release, except as required by applicable law.